GapingVoid had a nice image distributed through email with text that got me thinking about Square Wheels® and Agile Thinking that I reframed into my scheme of things. Their focus was on business thinking and being able to both think as well as act quickly and effectively. It got me thinking about the Wagon Puller’s natural reaction combined with the agile thinking of the Wagon Pushers, whose hands’ on perspective is often different. The View at the Front is, nearly always, different than the View at the Back of the wagon. I generated this Square Wheels Poster, and then thought, how would this best appear on a Culture Wall, and generated a second caption. YOUR thoughts on which you prefer would be great. 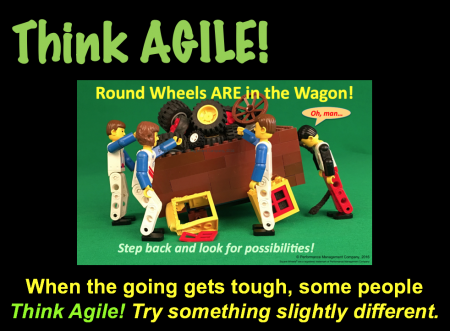 Agile Thinking and implementation are not about cutting costs or hiring some outsider to share perspective on what you should be doing differently. In my mind, the Round Wheels are already in the wagon and it is all about seeking to actively involve other people in the workplace to share and then implement new ideas. Nobody Ever washes a Rental Car, so the engagement of others is important when trying to build teamwork and go #morebetterfaster. ← Too Busy to Improve?